For 15 years, Opportunity traveled on Mars, sending back pictures and data, something truly incredible as the original mission was designed to last 90 days, let alone 15 years. The only other mission comparable to this, IMHO, is Cassini, another explorer that delivered invaluable research about Saturn in a mission lasting 13 years instead of 4. Needless to say, the scientists and engineers shepherding these guys grew to love them as they became, in a very real way, family, not just hardware, a sentiment yours truly understands without question. The rovers moved like migratory birds. 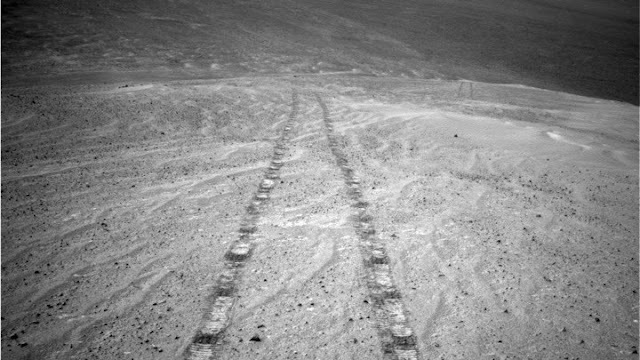 Opportunity and Spirit arrived on Mars within days of each other, at different locations along the planet’s equator, in January 2004, equipped with instruments to study the rust-colored soil. During the Martian winter, engineers directed the rovers to north-facing slopes, so that their solar panels could soak up as much sunlight as possible each day. When one of Spirit’s wheels stopped working, it kept going by driving backwards, dragging the defunct wheel behind it. But in 2009, the rover’s wheels broke through some crust and slipped into a sand pit. Engineers tried maneuvering the wheels this way and that, but the rover was stuck. For the first time, Spirit couldn’t make its way to a sunny slope. Spirit entered hibernation mode and never woke up. The mission was declared over more than a year after the rover’s last message to Earth and months of attempts to restore contact. Now it could be Opportunity’s turn. The rover hasn’t called home in 237 days. Last June, an enormous storm swept across the planet, clogging the atmosphere with sunlight-blocking dust, and the rover, unable to charge its batteries in the darkness, slipped into a deep sleep. “I haven’t given up yet,” Squyres said. I really hope I'm wrong about this.